MissMuffcake: Hats Off To My Boyfriend! Hats Off To My Boyfriend! This Saturday we will be in Sacramento - no not for home goods at Ikea or to hang out on the grid (however we are eating at Sugar Plum again!) but because my boyfriend's music video is being screened! 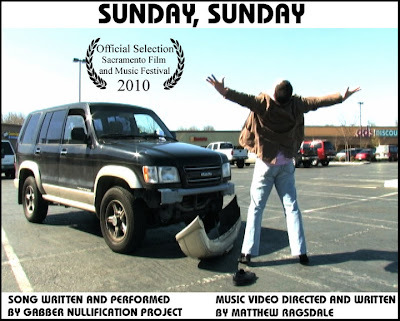 My boyfriend Matt's video for Gabber Nullification Project's song "Sunday Sunday" will be screened at Sacramento's Film and Music Festival. Congratulations Matthew. Mar and I love you and appreciate your talent! If you want to check out the video please go watch it on his YouTube channel.